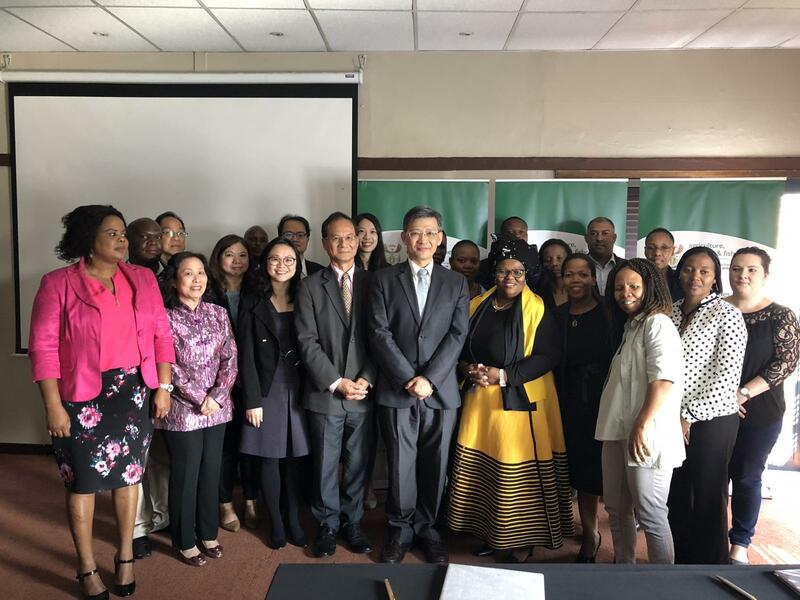 The Council of Agriculture (COA) of the Executive Yuan and South Africa’s Department of Agriculture, Forestry, and Fisheries convened the “3rd Meeting of the Taiwan-South Africa Joint Working Committee for Agriculture, Forestry, and Fisheries” on the 10th and 11th of this month (April) in Pretoria. The two sides discussed broad topics including agricultural policy, market access, trade and its promotion, and technical cooperation. They also reached consensus on the basis of mutual benefits on a number of agricultural issues, including: strengthening bilateral trade in agricultural products; cooperation on management of the fishing industry; combating illegal, unreported, and unregulated (IUU) fishing; facilitatingthe expansion of Taiwan’s ornamental shrimp into newly rising international markets; enhancingexchangeof aquaculture expertise and germplasm of bulb flowers. The two sides also agreed to deepen cooperation on agricultural technology as well as linkages between industries, and to work together to develop and extend the huge markets in places like Europe and Africa. The COA states that the agricultural departments of the two countries of Taiwan and South Africa have, since the signing in 2013 of Agreement on Cooperation in the field of Agriculture, Aorestry, and Fisheries, continued to promote all manner of cooperation on issues related to agriculture and fisheries, as well as to resolve problems in trade in agricultural products and to advance exchanges in agricultural technology. South Africa is one of the important producers of agricultural and livestock products in Africa, and also one of the important fishing bases for Taiwan’s distant-water fishing industry. In recent years, Taiwan has pro-actively explored marketing of all kinds of agricultural and industrial products to the African market, of which,frozen seafood and Phalaenopsis orchids are the main agricultural export items. As a result of the joint efforts of the two sides, the volume and value of bilateral trade in agricultural products between Taiwan and South Africa has shown a steadily rising trend. Through the regular mechanism of the “Taiwan-South Africa Joint Working Committee for Agriculture, Forestry, and Fisheries”, not only can the two sides further increase the volume and value of trade in fresh vegetables and fruit, flowers, aquatic products, and processed goods, they can also strengthen bilateral cooperative research & development of agricultural technology and the substantive relations between the two sides in terms of applications of innovative agricultural technology and industrial linkages. At the “3rd Meeting of the Taiwan-South Africa Joint Working Committee for Agriculture, Forestry, and Fisheries”, which was co-chaired by the director-general and the chief director from both sides, the two sides engaged in in-depth exchanges of opinions regarding issues that include strengthening marketing of agricultural food products, agricultural policy, agricultural technology, management of the distant-water fishing industry, exchanges of germplasm for ornamental flowers, development of the market for ornamental shrimp, vaccines foraquaculture , education and training in agriculture, and development of aquaponics. The two sides reached consensus on cooperation in many areas, which will not only be helpful to agricultural cooperation and exchanges between Taiwan and South Africa, but even more can deepen cooperative linkages between related industries, and will also, through South Africa, facilitate the entry of Taiwan premium agricultural products and agricultural technology products into the huge potential markets of Europe and Africa.